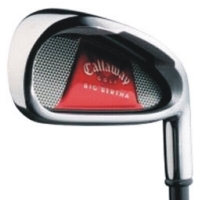 ***This is the traditionally shaped version of the Big Bertha 2008 irons. This version does not have any i-brid clubs. The low, deep center of gravity (CG) helps get the ball in the air quickly and easily, and the wide sole helps improve turf interaction. Designed for the ultimate in forgiveness in their oversize design with an increased offset, a large effective hitting area and a wide sole for exceptional turf interaction. Seamless performance progression throughout the set provides consistent distance separation with optimal trajectories. Extreme Notch Weighting redistributes more weight to the perimeter for a higher moment of inertia (MOI) and more stability. VFT Technology maximizes ball speed and perimeter weighting for more distance and forgiveness; S2H2 increases discretionary weight by removing it from the hosel and repositioning it in the perimeter of the clubhead; 360-Degree Undercut Channel maximizes perimeter weighting by moving the CG lower and farther back.